In 1914, Arthur Keith said "the Piltdown remains have been universally accepted as ancient and authentic." People familiar with the case today assume that, in 1914, Piltdown Man was in fact universally accepted. But that is not the way it was. Most British scientists accepted the fossil as a very old and singularly single hominid being, but not all. The finders themselves did not accept everything uncritically. Dawson didn't believe that the eoliths in the pit had been instruments made by Eoanthropus, despite pressure from Lewis Abbott to interpret them as such. Woodward intermittently distrusted his earliest Englishman. Piltdown Man did not fit into accepted evolutionary models. In a paper read before the Geological Society on April 29, 1914, Woodward said that in the gradational series from the fossil primates Mesopithecus to Dryopithecus to Heidelberg Man "there appears to be no place for a stage resembling that of any adult existing Ape. It is difficult even to understand how Eoanthropus can be one of the series" (Woodward, 1914). What the third digger, Teilhard de Chardin, thought about the fossil's authenticity, his letters do not reveal. If either Dawson, Woodward, or Teilhard were the Piltdown hoaxer, then of course whatever faint skepticism they expressed was just part of the charade. E. Ray Lankester, director (1898-1907) of the British Museum (Natural History), a professional biologist and an esteemed popularizer of science, supported some aspects of the find and denied others. After the first Geological Society meeting on the discovery, Lankester admitted the importance of the find, but then said that having visited the pit and  examined skull fragments and jaw, he was not certain that those remnants had been the apparatus of a single individual, and he would draw no conclusion about their age. In "The Missing Link" (Lankester, 1915), however, he came out for unity of cranium and jaw but did not believe that Eoanthropus had made the tools. He remained baffled. Arthur Keith, uneasy about the fit between so apelike a jaw and so human a skull, was among the hundred or so Geological Association members who toured the pit in July 1913. He and a Major Marriott went to visit a bank clerk and ornithologist named Harry Morris. In his autobiography, Keith recalled that Morris was so annoyed at the "acclamation given to Dawson and his own "neglect" that he gave expression to a "sour" skepticism about the whole affair. Morris did not tell his visitors that he had been writing memoranda to himself and hiding them in a cabinet full of flints. A British Dental Journal article, "The Piltdown Skull" (1913) punned, "Veritably a bone of contention, this interesting anthropological document is still a matter of lively discussion." Two events illustrating this remark constitute the most important documents of British skepticism about Piltdown Man. The first was a single column article that appeared in Nature in December 1913. David Waterston, a professor of anatomy at King's College , took issue with the supposition that the skull and jaw had belonged to the same individual. According to Waterston, radiograms taken of the mandible proved it to be simply an ape's. The analogy is not dramatic but the point is clear enough: the supporters of Piltdown Man's authenticity had made a bad mistake. If Waterston's view was correct, then Piltdown Man would have been only an old human skull accidentally allied with an ape's jaw, of no more significance than any of the other hominid fossils dug up in the United Kingdom. The next skirmish is a one-act farce, the protagonist a dental anatomist anxious to prove to a panel of Piltdown fans that the canine tooth could not have been as described. The skeletal summary given below can be fleshed out with images of panelists yawning, grunting, and now and then displaying their own canines. Panelists: Dr. Arthur Smith Woodward, Professor Arthur Keith, Professor Arthur Underwood, Professor Grafton Elliot Smith, Mr. Pycraft, et al. Dr. Lyne noted that in all animals from iguanadons and salamandrine labyrinthrodonts to dogs and chimpanzees and people, the pulp invariably diminishes with advancing age. The large pulp (and heavy dentine formation) of the Piltdown canine tooth indicated that its possessor was young. Yet the sagittal sutures of the skull had closed, which indicated that the being was mature. Dr. Lyne marveled at this prodigy, mature in the head and juvenile in the tooth. He expressed his bafflement at the next incongruity, between the mandibular fossa, of a kind that would hold a free-swinging human jaw, and the canine, which being raised above the level of the other teeth would have prevented such rotary freedom. Even worse, in the reconstruction the canine was already raised high, which meant that the permanent tooth replacing it would have projected even more, more than in any known anthropoid: "The act of yawning with such articular mobility and with projecting canines would be one which Piltdown Man would not be likely to indulge in with pleasure." In human beings, the permanent canines erupt before the permanent molars; a study of Piltdown dentition shows that its permanent canines erupted after the permanent molars. The Piltdown canine was a milk tooth, as shown by its large pulp; in the orangutan's mouth, the milk canine is still in place when the second permanent molar has erupted. Since in the Piltdown jaw, the canine was a milk tooth and the molars permanent, the sequence of eruption demonstrated that the jaw was an ape's and not a person's. Lyne suspected that the canine did not belong to that jaw and that that jaw did not belong to that skull. But he had hopes for future clarification of this exceedingly strange contraption: "The loom of Time may yet weave for us the sure features of this creature." Woodward rose for the first rebuttal: It was impossible that a unique primate skull would be found in the same deposit as a unique primate jawbone and a unique primate tooth. Keith acknowledged that the pulp cavity does steadily decrease with age, that there was a problem of compatibility between human mandibular fossa and ape canine, and that the degree and kind of wear of the canine were out of keeping with the other fragments. But you can't argue against the empirical evidence. Underwood proposed that the canine was not a milk tooth, but an elderly permanent tooth, so old that its surface tissue had been worn away and a hole punctured right into the pulp cavity. Smith wryly observed that Keith had opted for a canine older than the molars and that Lyne had opted for one younger. Lyne had forgotten that no fossil apes had been found from Pleistocene England. He drags in a hypothetical ape. Lyne retaliated that the unfortunate animal could not have shut its mouth. We are of opinion that future discovery will show that all three specimens are, as Dr. Smith Woodward inferred, parts of one individual, or at least of individuals of one species. A closer acquaintance with the anatomy of anthropoid apes will reveal many similar incongruities in their structure. If mankind has been evolved from an anthropoid stock the occurrence of a combination of human and anthropoid characteristics in earlier or dawn human forms, such as occur in Eoanthropus, is just what we ought to find. It certainly wasn't enough to cause even a hairline fracture in the Anglo-American alliance, but the controversy taking place in paleontology assumed the dimensions of a fight between English Nature and American Science. Nature had backup from the British Museum of Natural History. But Science could look over its shoulder and see a comforting platoon of skeptics inducted from the Smithsonian Institution, the American Museum of Natural History, and Yale University. A research scientist at the Smithsonian Institution undertook the most exhaustive and destructive analysis of the creature. Its result could have been the decisive dissociation of cranium and jaw and the evaporation of Piltdown Man. Gerrit S. Miller, Jr., in his "Jaw of the Piltdown Man," published in November 1915, did not try to unravel the Piltdown knot. He cut it. Having borrowed casts of the Piltdown fossils from Ales Hrdlicka, Miller proceeded to compare the mandible with those of 22 chimpanzees, 23 gorillas, and 75 orangutans, a populous apiary. He began the process of dissolving Piltdown Man as a unified being by expressing his disappointment that the condyle was missing: "Deliberate malice could hardly have been more successful than the hazards of deposition in so breaking the fossils as to give free scope to individual judgment in fitting the parts together." Miller categorized three kinds of evidence authenticating Piltdown Man. 1. The distributional evidence showed that no ape fossils had ever been found in England, from which one could deduce, as Smith and Gregory did, that the jawbone therefore had to be human. Miller said that an ape could have existed in England, the paleontological record is scanty, and a tooth that was like the first molar of a chimpanzee had been found in 1895 in Taubach, Saxe-Weimer. 2. The paleontological evidence was that the relics had been found close together. But finding relics close together does not compel the conclusion that they had come from the same source. 3. The third kind of evidence, the anatomical, took up most of Miller's analysis. This analysis is extremely detailed and without flab; its style is sharp, clear, at times elegant; and its thesis, hindsight proves, correct. Miller's procedure foreshadowed that of the paleontological sleuthing of mid-century. Anyone could have seen, and everyone did see, that the jaw owned a simian shelf but not a condyle. Miller did not focus on such gross structures. He measured the curvature of the dental arcade and jaw, the borders of the molars, the smoothness of the enamel, the elevation of the mylohyoid ridge, the very cusps and the depressions between them, and he concluded that in every specific diagnostic feature the jaw was not like that of an ape's. There was a sentiment in the scientific world that what Woodward and company had wedded, nobody ought to sunder. Miller split the contraption apart and told a new story. He assigned the cranium to a hominid Eoanthropus all right, but the jaw, which was in the regular flattening of the molar occlusal surfaces too highly unusual even for extant chimpanzee teeth, to a British extinct Pliocene ape, for which he invented the name Pan vetus. Association can never be made to take the place of articulation; and so far as Piltdown is concerned, nothing short of the actual articulation of the mandible with the skull should have sufficed to outweigh the lack of harmony existing between these parts. He classified the cranium as Homo dawsoni, a member not of a new genus but merely of a new species; and the jaw and canine as part of a fossil chimp. His analysis relied on Lankester, Waterston, continental paleontologists, and Miller. The conclusion of the article was a salve to calm the sting hurting British fans: "As for the man of Piltdown, he still exists and is quite as ancient as he was before the revision, which is saying a good deal; even if he is robbed of a muzzle that ill became him." He would later replace the muzzle. Miller also influenced staff members of the American Museum of Natural History. In one of his letters home, Teilhard de Chardin wrote that he had met a "certain" Gregory while staying with Woodward in London. In 1914, William King Gregory published an article that repeated the hoary paleontological syllogism: no apes had existed in Pleistocene England; an ape's jawbone had been found in an English Pleistocene deposit; therefore the jawbone was consistent with the cranium. But anatomical reasoning suggested it could not be. The uninhabited alveolus for the third (and missing) molar suggested that that molar would have been too large for a human mouth. The inner side of the chin region lacked genial tubercles (genial not meaning friendly, but pertaining to the chin; and tubercles meaning small tubers, or bumps) for attachment of the genioglossus muscle of the tongue. The canine did not seem to belong to that lower jaw. Perhaps it was not a right lower canine, but a left upper. And, if that was so, then "its wearing surface is such that the first lower bicuspid which occluded with it must have been elongate and prominent and much more anthropoid than human in shape." Gregory was also troubled about what he thought the most controversial part of the Piltdown find: the size of the braincase. This skepticism was invigorated by Miller's analysis. 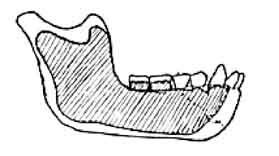 For the American Anthropologist, Gregory wrote a "Note on the Molar Teeth of the Piltdown Mandible" (1916). Paying his respects to Miller, he argued in favor of a "generic identity" between the Piltdown jaw and teeth and those of a chimpanzee. Gregory listed MacCurdy and W. D. Matthew as American skeptics. Gregory, Matthew, and C. R. Eastman co-authored a short article, "Recent Progress in Vertebrate Paleontology." Matthew here called Miller's argument "irrefutable." "It is hardly to be expected, however," they warned, "that this conclusion will be readily accepted by the European writers." Gregory's boss, Henry Fairfield Osborn, president of the American Museum of Natural History, was also a mild skeptic at that time. His Men of the Old Stone Age (1915) described the small and broad nasal bones as typically human, like those of primitive Malay and African faces; the jaw typically ape, except for its molar teeth, though even these "approach the dentition of the apes in their elongate shape and well-developed fifth cusps"; and Piltdown Man unrelated to Heidelberg or Neanderthals or "any of the existing species of man." It was a side-branch and went extinct. In the reconstruction by Professor J. H. McGregor, which Osborn reproduced, a better synthesis of human and ape was achieved by placing the canine as left upper, curving the dental arch, and  deepening the chin, reducing the beastly prognathism of Woodward's reconstruction. Osborn was unsure whether Piltdown Man was a unified being. Seemed as though the jaw was that of an ape, the skull that of a Britisher. The Britisher Arthur Keith didn't care for the compliment. "From a British point of view," Keith wrote in his 1917 review of Osborn's Men of the Old Stone Age, "our author is all at sea as regards the discovery of Piltdown." The cranium and jaw agree in their texture and fossilization and size, and the teeth, Keith under pressure asserted more strongly than usual, are "as unlike chimpanzee teeth as teeth can be." He chided that Osborn could not blame his British allies "if they fail to give his judgment that due which his great services to palaeontology should naturally demand from them" for he "has done less than justice to the work and opinions of his British colleagues." In a review of Keith's The Antiquity of Man (1915), the American anthropologist William Wright complimented Keith for his willingness to sacrifice theory to facts, but declined to compliment Piltdown Man for anything. To the other incongruities, Wright added one between molars that are human and a canine that is simian. Miller's argument seduced an English authority into the camp of the skeptics-P. Chalmers Mitchell, who rejected the new hypothesized ape but approved of Miller's confirming "the doubt already stated by many investigators" about compatibility of jaw and cranium. W. J. Sollas, however, maintained that since the two parts had been found rubbing elbows with each other, and agreed nicely anatomically, the chance of their having come from different sources was "unworthy of serious consideration." W. P. Pycraft cooked up the most peppery rebuttal to Miller and spiced it with rhetoric about the American's dogmatic statements, warped judgment, and distortions of fact. It is obvious, his January 1917 article in Science Progress insisted, that the Piltdown jaw was more like a human's (e.g., the Kaffir's) than like an ape's and that the Piltdown molars showed a surface at right angles to the vertical axis of the tooth, a feature of human teeth. The three tubercles on the Piltdown molars, the thickening of the enamel, and the wear on the molar occlusal surface are all more human than simian. Miller's reply to Pycraft's reply demonstrated that the tubercles, enamel thickening, and occlusal wear are features of orangutan molars. In continental Europe, Piltdown Man was tolerated in the professional literature without great enthusiasm. Professor MacCurdy, in his 1924  review (in Human Origins) of continental reception, generalized: "Objections soon came from France and Italy." G. Sergl's "La mandibola umana," Revista di Antropologia (1914) accepts Piltdown Man as authentic. Other Italian writers were respectfully but steadily skeptical. Influenced by Miller, V. Giuffrida-Ruggeri wrote in his 1918 L'Uomo Attuale una Specie Collettiva that Piltdown Man was a doubtful specimen. It took some virtuosity to connect a human cranium with a monkeylike jaw, "nonche il canino""-not to mention the canine. No one could know what it all meant. The most thorough of the Italian works was Nello Puccioni's Appunti in torno alframmento manibolare fossile di Piltdown (Sussex) (1913). Puccioni was discontented with Woodward's reconstruction of the jaw because it was neither simian nor Neanderthal. Too crude to harmonize with the relatively fine features of the cranium-"né carne ni pesce, " neither fish nor fowl, it remained questionable whether it could enter the family of the Hominidae. He cites Lankester and Waterston in support of his opinion that the jaw and the cranium belonged to two distinct individuals. A Spanish work, Hugo Obermeier's El hombre fosil, also questioned the feasibility of imposing harmony. R. Anthony, in a Revue anthropologique article of September 1913 ('Les restes humains fossiles de Piltdown') took Keith's side in the dispute about cranial capacity, but said he would prefer Piltdown Man as a member of our own genus (Homo dawsoni). In 1912, Boule shared the opinion of Dawson and Woodward on the unity of Eoanthropus. Then he read Miller. In his 1915 La Paleontologie humaine en Angleterre, he recommended that, since the jaw was exactly that of a chimpanzee, it should be removed from the cranium and given the name of a hypothetical extinct ape, Troglodytes dawsoni. He professed his duty to be that of a skeptic concerned about the integrity of his science. A Dutch commentator, Professor H. V. Buttle-Reeper, in Man and His Forerunners, maintained that Piltdown Man was Neanderthal, its front teeth more human than Woodward had assumed. A Danish commentator, M. Ramstrom, influenced by Miller, in 1919 published "Der Piltdown-Fund"- which swirls in the complex riddles of uncertain discoveries, incomplete reports, and antagonistic interpretations. Ramstrom can't figure any of it out. "Who is right?" he queries. "Who stands on firm ground?" "This, then, is the real evidence?" After praising the dynamic and purposeful research, he leaves us with an intriguing diagnosis: "Probably some of the conclusions and theories are correct; one just doesn't know which ones." An objective poll of the international scientific community in the four  years after the Geological Society announcement fails to validate the widespread opinion that this community was fooled by Piltdown Man. Some, mostly British, were impassioned advocates, such as Keith, Smith, Sollas, and Pycraft, seconded by some continentals. But many continental, and most American, scientists were skeptical. In the winter of 1912-1913, Woodward exhibited the reconstructed skull to the International Congress of Medicine, which met in Dublin. The Dublin Daily Express on August 13 inferred that a serious mistake had been made in the interpretations of Pithecanthropus and Eoanthropus. "Both creatures present curious combinations of ape-like and man-like features; but as the points that are man-like in the one are ape-like in the other, and vice versa, it follows that their claims to stand in the line of human ancestry would be mutually destructive." Pithecanthropus is probably the valid ancestor, for the Piltdown skull is only that of a human being, at best a racial variety (Homo piltdownensis). Labeling it as a new genus (Eoanthropus) involves "great biological heresy." Professor Keith is mistaken in trying to force the lower jaw into conformity with the skull and in claiming a great antiquity for the combination. "It is certainly strange," this remarkably prescient report continued, "that if the Sussex skull belongs to a race that had inhabited Western Europe for a million or a million and a half years down to the birth of modern man, we have no other skull of the type it represents to match the Piltdown specimen."